This TubePress add-on provides TubePress with enhanced access to your Vimeo Plus or PRO account, thus allowing TubePress to work with private Vimeo videos. 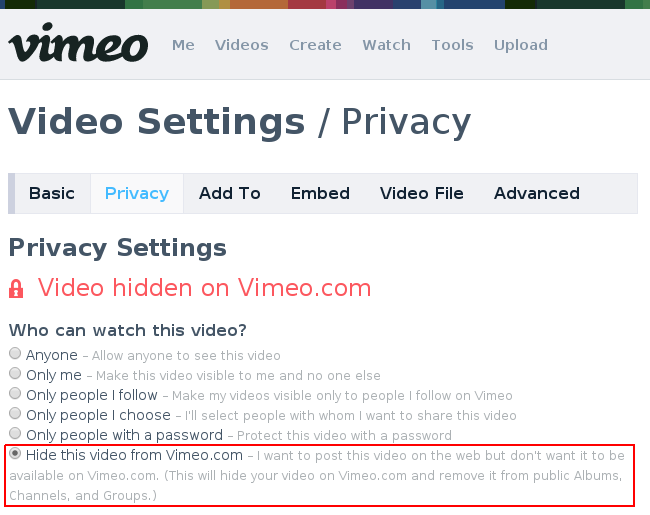 This is particularly useful if you’d like to hide your videos from display on vimeo.com and only show them on your website. Unzip the file you downloaded (vimeo-all-access_x_y_z.zip) into the add-ons subdirectory of your TubePress Content Directory (wp-content/tubepress-content/add-ons). You should now have a directory at wp-content/tubepress-content/add-ons/vimeo-all-access_x_y_z (where x, y, and z are the major, minor, and micro version numbers of the add-on. If you haven't already done so, complete the initial Vimeo API setup process. Under the "Feed" tab of your TubePress settings page, scroll down to the Vimeo area and click the "New token" button. A popup window will open and ask for your permission to allow TubePress to access your private videos. Click the "Allow" button to grant permission. The popup window should close itself automatically and you should see a success message. And you should see a new token in your list of API tokens. Under the "Which Videos?" tab, select the "Feed Options" tab for any Vimeo video source. Use the "API Token" dropdown menu to choose your new All Access token. You may repeat the above process to obtain additional tokens, which may be useful if you have several Vimeo accounts under your control.